ST. LOUIS — The Saint Louis Zoo got a shout-out on national television this week, putting one of its lesser-known residents in the spotlight. Chelsea Clinton was on ‘Late Night with Seth Meyers’ to discuss her new book ‘Don’t Let Them Disappear,’ which is about endangered animals. 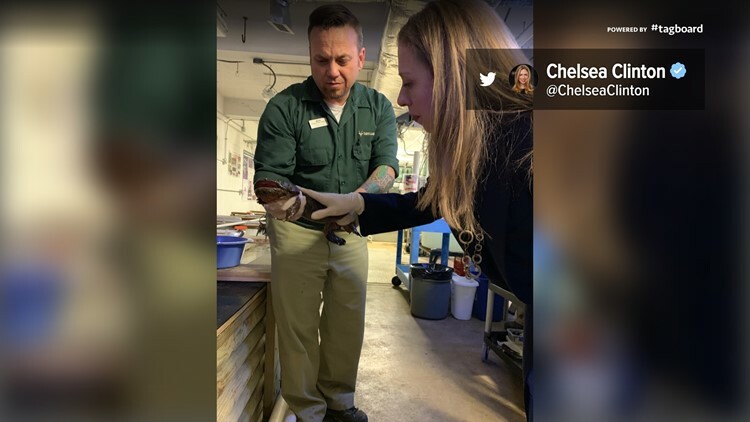 She was fresh off a trip to the Saint Louis Zoo where she got up close with a hellbender, one of the endangered animals the zoo is trying to help. Seth Meyers showed off a photo that she had tweeted of her petting the Saint Louis Zoo’s hellbender. But Clinton’s colleague Joy Secuban wasn’t so smitten. Clinton then gave a shout-out to the zookeeper Mark and the Saint Louis Zoo. On its website, the zoo states the number of hellbenders that live in the Ozarks have declined by more than 70%. Clinton left 'Late Night' with a momento from her trip to the Saint Louis Zoo. She laughed and asked Meyers to keep the photo of Secuban's reaction to touching the hellbender. To watch the full clip of Clinton on 'Late Night' click here or view the video below.